Friends of Dacorum Museum | The Dacorum Heritage Trust Ltd.
Why not become one of our Friends? Some of the benefits you will receive include outings, social events, talks and discounts on Trust publications. Friends also receive a posted copy of the Trust’s quarterly newsletter. Annual subscription is £4 for an individual or £6 for a family. For more details contact: Mrs Angela Cross, Membership Secretary, FODM, 39 Beechwood Park, Hemel Hempstead, Herts. HP3 0DY. The ‘Friends of Dacorum Museum’ was originally formed in 1982 to provide support to the Dacorum Museum Advisory Committee. Assistance was given by buying artefacts and helping to steward exhibitions. Over the years we have bought, or helped with the purchase of, a variety of objects which have interesting connections with the Borough of Dacorum. The money for these purchases is raised from subscriptions and visits to places of historical interest, particularly in and around the Borough. 2005: Guided tour of Verulamium Museum. 2006: Tour of Roman London, guided by Peter Clayton, FSA. 2006: Louisa Cottages, Guided tour of Tring. 2008: Laying tributes at Grave of Sir John Evans on Centenary of his death, 31st May. Attended by representatives of the Society of Antiquaries and Ashmolean Museum, Oxford. 2008: AGM at St Lawrence Church, Abbots Langley. Chromolithograph: Matthew Leno, Bantam Breeder and Judge from Leverstock Green. (DACHT: 2456). Hemel Hempstead Temperance Coffee Tavern tokens. (DACHT: 2454). Gadebridge Post Office sign. (DACHT: 2453). Book, Sir John Evans, 1823-1908. (DACHT: 2654). Illustrated book about life in medieval France by Dame Joan Evans. (DACHT: 2445). 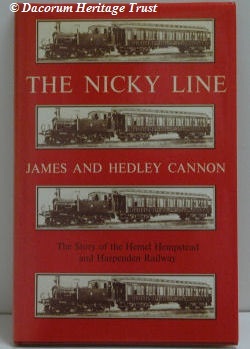 Book, The Nicky Line by James and Hedley Cannon. The story of the Hemel Hempstead to Harpenden branch line. (DACHT: 2557). Metal badge awarded by Berkhamsted Motor Cycle and Car Club to R Stanley for the Chairman’s Speed Trials of 1934. (DACHT: BK 8169). British Railway poster showing a picture of the village of Aldbury by Jack Merriott. (DACHT: 1871). 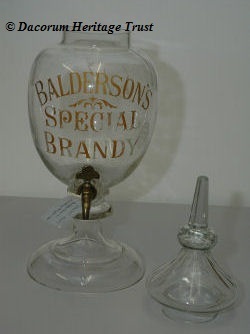 Balderson’s Glass Brandy dispenser with lid. (DACHT: 2452). Jug with German pink lustre glaze and a transfer picture of Hemel Hempstead High Street prior to 1880. (DACHT: 2594). Nicky Line – book donated by Friends of Dacorum. Brandy dispenser – glass object donated by Friends of Dacorum.